When you’re creating or editing your opportunity, enable or disable surcharges using the checkboxes under the surcharges section. This is a list of surcharge groups. Surcharges that are set up as default are always applied, regardless of the boxes ticked here or how the product is configured. 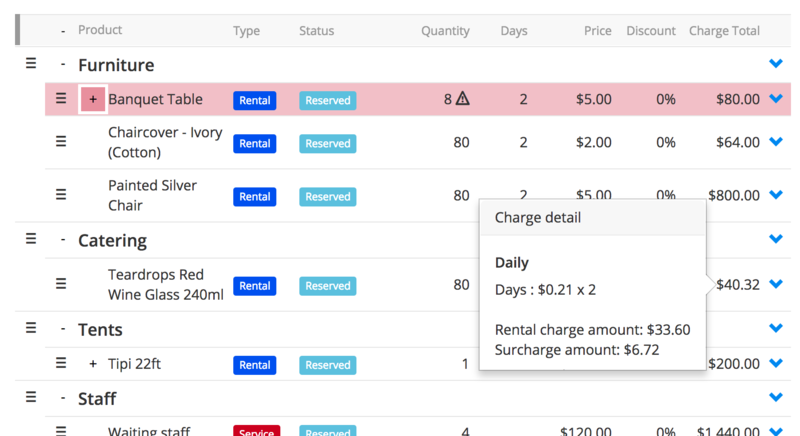 When a surcharge group is ticked, any rental items with a surcharge configured in that group added to the opportunity will include that surcharge in the charge total. Hover over a charge total in the items list to see the included surcharge. Every opportunity is different, so there might be times that you need to add, remove, or change a surcharge for a particular opportunity item. To do this, edit the opportunity item by clicking the blue arrow to the right and choosing Edit from the menu. Use the drop down boxes in the Surcharges section to add or remove surcharges from this particular line. Would I use this to apply a credit card surcharge? Keep in mind that surcharges only apply to rental products by design. If you’ve surcharges that are applied to the entire charge total for an opportunity, this might not be for you. In these cases, you could set up a non-stock sale product called “Surcharge” or something similar, then add this to the opportunity and manually specify the price. Can I see surcharges on my document layouts? Our default opportunity documents don't display a separate surcharge total, but this is something that you can change.